Circa breaks down stories into bite-sized chunks designed specifically for a mobile screen. That’s Tim Shundo. He’s the lead designer behind a news app called Circa. At first glance, Circa may resemble Rupert Murdoch’s struggling iPad publication, The Daily: It has its own editorial staff, and its content is meticulously designed for mobiles. But its sensibility is the product of its founders–faces from Digg and I Can Has Cheezburger?–rather than traditional print media. And at its heart lies a unique reformatting of current events and breaking news that Shundo thinks mobile users will latch on to. On first loading the app, Circa’s baseline is the same headline/thumbnail feed we’ve seen a hundred times before. But when you click to read, you realize that stories are broken into readable bullet points, which Shundo likens to flashcards. Rather than scroll through a long column of text–doing that dance where you try to hold your thumb on the screen while you read around it–you flick down a list of blurbs, each perfectly truncated to take up no more real estate than the iPhone 5’s screen. It makes sense. For whatever journalistic expression may be lacking in the abridged story format, Circa compensates through information-cramming, blog-crushing efficiency. And these flashcard updates hold another benefit: As stories develop and new facts arise, the format is easily expandable. And users can subscribe to any story’s updates rather than constantly tapping “refresh” on the off chance there’s been something new added. No doubt, there are certain types of stories Circa will never be able to tell (think of any long-form narrative piece you’ve read recently–it just wouldn’t work in this rigid format). 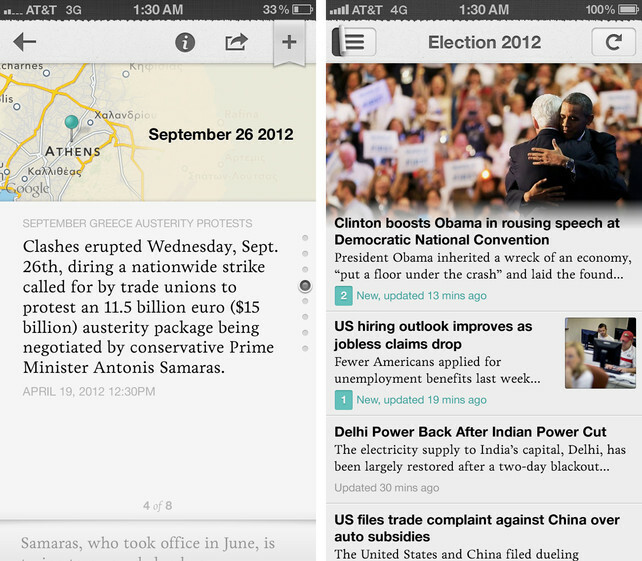 But as a news app for keeping mobile users apprised to current events? Even at v1.0, Circa is doing a lot more by, very intelligently, doing less.